Why Do Cops Who Shoot Unarmed People Get Their Guns Back? 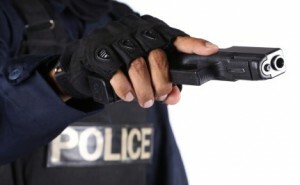 What happens to police officers who shoot unarmed citizens while on duty? More often than not, nothing. Even in the most egregious examples of misconduct and bad policing, officers are found not guilty in court (if they even stand trial in the first place) and are free to return to duty… re-armed to potentially cause more harm in the future. This pattern is a serious miscarriage of justice. By refusing to hold police officers to a certain standard, it signals that cops can pretty easily get away with murder. With no reason to fear consequences, the police can continue to shoot at innocent or not-dangerous suspects without worrying about how it will affect their careers. 1. While on a manhunt for Christopher Dorner last year, LAPD mistook a vehicle carrying two older women delivering newspapers for that of their suspect. (For the record, the truck was a different make and color than the one for which they were searching.) Without even first identifying the car’s driver or passenger, eight police officers fired more than 100 bullets into the car, seriously injuring senior citizen Emma Hernandez. This shoot first/check later approach cost the LAPD $4.7 million in a settlement, but the officers involved have received a minimal slap on the wrist: “retraining” before being re-armed and put back on the beat. 2. After being involved in two questionable shootings in a matter of a few months, Chicago cop Gildardo Sierra was permitted to continue to patrol the streets. Not even half a year since the first shooting, Sierra fired 16 bullets into an unarmed man.